Vertigo - an intense sense of spinning. This is usually episodic and can range from mild to severe. The vertigo attacks of Meniere's disease are rotational and the duration of each episode must be at least 20 minutes in order to be classified as Meniere's disease. Hearing loss - fluctuating low-frequency sensorineural hearing loss that becomes worse during attacks and may permanently deteriorate over time. Tinnitus - typically a low tone ringing or roaring noise in the ears. Aural fullness - a sense of fullness in the ear. Initial presentation of symptoms for Meniere's disease is variable among patients. Some people may experience a fully-developed attack of Meniere's disease with all of its symptomatic manifestations, while for others, vertigo or other symptoms may appear alone and precede fully developed Meniere's disease by many months or years. Meniere's disease most often affects adults between the ages of 40 to 60. Isolated symptoms can appear between ages 20and 60. It is uncommon for people older than age 60 to develop Meniere's disease. Approximately 40,000 new cases of Meniere's disease are diagnosed annually in the United States. Only about 3% of patients diagnosed with Meniere's disease are children. Male to female ratio ranges from equal to a slight preponderance of females over males. Some women report improvement of symptoms following pregnancy. In approximately 5% of cases of Meniere's disease, there is a positive family history for the condition indicating that there is a genetic component in a subset of individuals with Meniere's disease. Although most cases of Meniere's disease are unilateral, approximately 10-50% of patients also develop symptoms in the opposite ear. There is no predominance of right or left ear. If you or a loved one has been diagnosed with Meniere's disease, it's critical to learn everything you possibly can about this condition so that you can make informed decisions about your treatment. That's why we created the Medifocus Guidebook on Meniere's Disease, a comprehensive 137 page patient Guidebook that contains vital information about Meniere's disease that you won't find anywhere in a single source. The theories regarding the underlying causes of Meniere's disease. The triggers that may precipitate an acute attack of Meniere's disease in some patients. How Meniere's disease is diagnosed based on factors such as signs/symptoms, patient history, physical examination, and audiometric (hearing) studies. The medications that are commonly prescribed for the management of acute vertigo attacks in patients with Meniere's disease. A new implantable device, called the Meniett device, that delivers intermittent pulses of positive air pressure to the inner ear and has been shown to significantly reduce the severity of vertigo in people with Meniere's disease. The risks, benefits, and complications, associated with the various surgical techniques that are used for the treatment of Meniere's disease. The role of cochlear implants and vestibular rehabilitation in the management of people with Meniere's disease. Nutritional and lifestyle modifications that can help you better control the symptoms of Meniere's disease. The role of complementary and alternative therapies in the management of Meniere's disease. Important questions to ask your doctor about Meniere's disease. A Guide to Recent Medical Literature on Meniere's Disease - This section of the Guidebook contains an extensive bibliography of over 100 references to recently published articles about Meniere's Disease in authoritative, peer-reviewed medical journals with links to the absracts (summaries) of the articles. These articles represent the latest advances in the field and focus on cutting-edge research, new developments, and the lessons learned from recently published clinical trials involving patients with Meniere's Disease. This is the same level of that is used by doctors who treat people with Meniere's Disease to keep abreast of the latest developments and breakthroughs in this specialized field of medicine. Centers of Research for Meniere's Disease - We've compiled a unique directory of doctors, hospitals, medical centers, and research institutions with special interest and, in many cases, clinical expertise in managing people with Meniere's Disease. The "Centers of Research" directory is a valuable resource for quickly identifying and locating leading medical authorities and medical institutions both within the United States and other countries who are considered to be at the forefront in clinical research and treatment of Meniere's Disease. You'd have to spend days - or even weeks - attempting to compile your own list of doctors and medical centers but, with the "Centers of Research" directory, the information is already right at your fingertips. All you have to do is act on the information by selecting and contacting the experts or medical institutions listed in the directory by state and country. 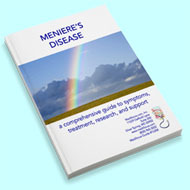 Organizations and Support Groups for Meniere's Disease - The Guidebook also includes a directory of organizations and support groups whose goal is to help people with Meniere's Disease by providing access to information, resources, and services. Many of these organizations can answer your specific questions, enable you to "network" with other patients, and provide guidance in areas such as financial, social, or medical-legal issues. This valuable directory of organizations and support groups includes complete contact information, including phone numbers and E-mail addresses. 20% Discount - For a limited time, you can purchase the Medifocus Guidebook on Meniere's Disease at a special 20% discount off the regular list price. Your 20% discount will automatically be applied when you go to "Checkout". Order Your Copy of the Medifocus Guidebook on Meniere's Disease Today! The Medifocus Guidebook on Meniere's Disease is available in the following two convenient formats: Printed and Digital. "I am very grateful for your MediFocus Guidebook on Meniere's Disease. It gave me the tools that I needed to research Meniere's. By educating myself about this condition, I feel that I am able to participate in my course of future medical procedures. It wasn't left up to the doctor alone to do what he thought was best. I have a say in what happens to me. Thanks to your Guidebook, now I am an "informed" patient."